If you’re looking for heavy equipment transport companies, you’re in the right place! When one needs to ship oversize equipment, such as hauling trailers, can be a very difficult challenge, but our experienced Logistics Specialist can easily accommodate any customer or company needing to transport one or multiple heavy equipment including:Heavy Equipment Transport: Dump Trucks, Road Wideners, Excavators, Oil-field Drills, Bull Dozers, Backhoes, Scrapers Compactors Boring Machines, Stone Lingers, Generators, Concrete Mixers, Tanks, Lifts, Vacuum Trucks, Water Towers, Trailers, Utility Trucks and Equipment, Plow Trucks, Log Loaders, Welders Wheel Loaders, Concrete Pumps, Cranes, Ditch Diggers, Forklifts, Railroad Equipment, Motor Grader, Snow Equipment Tractors, Crushers, Light Towers, Pipe Layers, Drilling Rigs, Earth Movers, Haulers, Step Decks, Bucket Trucks and Tractors. Name, Make, Model, and the number of heavy equipment that needs to be shipped. We will need the dimensions: Height, Weight, Width, and Length. Complete address of Pickup and Delivery with preferred dates and times. Best Heavy Equipment Transport Company in the US. Are you interested in having your Heavy Equipment Shipped? Go with the premier name in Heavy Equipment Transport Company! Call We Will Transport It today to get your free quote! Flatbed Trailers, Removable Goose neck Trailers, Lowboy Trailers, Step Deck Trailers, Double Drop Trailers, Hot Shot Trailers, Specialized Trailers and Extendable Trailers built to handle any and all over-sized vehicle. Heavy Equipment Transport Services. The estimated time for pickup and delivery (please keep in mind traffic, weather, and distance. Once your oversize equipment has been picked up by one of our fully licensed, insured and bonded carriers, our dispatch department will be in constant communication with you until the vehicles have been delivered. Our driver will contact you within 24 hours to schedule the time for the pickup and 24 hours before the date of delivery. When you need Oversize Equipment Transportation-Heavy Equipment Transport, whether you need an expert for hauling trailers, forklifts or dump trucks, we can handle it. If you are a specialty dealer, construction company, police department or military personnel, we will set up a repeat customer id account and offer discounts for multiple specialty vehicle transportation shipments. Also, be sure to ask us about our car transport services. Shipping your oversize loads and overweight freight, Heavy Equipment Transport is a mighty challenge, notwithstanding for those with broad involvement with particular transportation. Regardless of which Heavy Equipment Transport Industry, when you require focused transportation experts for your larger than average shipments you can rely on International Logistics Express, Inc’s group ability to send your curiously large loads securely and effectively. Heavy Equipment Transport Services for all your needs! Heavy Equipment Transport. The protected and lawful transportation of-of heavy cargo and construction equipment is no simple assignment. When dealing with the absolute most gigantic bits of apparatus at any point worked by mankind, a set stacking, transportation, and emptying convention isn’t just a best practice — it’s the main practice. Vehicle accidents due to heavy trucks and cargo transport are on the rise. This merely reinforces how vital it is to not only follow proper loading and unloading procedures in the yard but also safely haul that equipment while on the road. Heavy Equipment Transport. Transportation larger than average freight is a test we have confronted effectively for a long time. Every single curiously large shipment is special and requires learned and proficient consideration to guarantee the well being, appropriate taking care of and consistency with a wide range of directions. At International Logistics Express, Inc., our experts go the additional progression for the delivery of your curiously large freight anyplace on the planet and adopt a hands-on strategy at the arranging and execution of your over-dimensional venture. Our Heavy Equipment Transport service include to pack your cargo appropriately, pick the best possible transporter, acquire protection and timetable a helpful conveyance date. Are you looking for a Heavy Equipment Transport Truck? We Will Transport It is a five-star Heavy Equipment Transport Company, Car Transport, International Shipping Company and heavy load hauling specialist will give you the top rate service for a fair price. 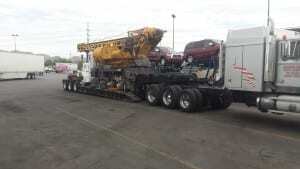 We Will Transport It, the Best Heavy Equipment Transport Company in the U.S. If you’re looking for heavy equipment transport companies, you’re in the right place! When one needs to ship oversized equipment, such as hauling trailers, can be a very difficult challenge, but our experienced Logistics Specialist can easily accommodate any customer or company needing to transport one or multiple heavy equipments including:Heavy Equipment Transport: Dump Trucks, Road Wideners, Excavators, Oil-field Drills, Bull Dozers, Backhoes, Scrapers Compactors Boring Machines, Stone Slingers, Generators, Concrete Mixers, Tanks, Lifts, Vacuum Trucks, Water Towers, Trailers, Utility Trucks and Equipment, Plow Trucks, Log Loaders, Welders Wheel Loaders, Concrete Pumps, Cranes, Ditch Diggers, Forklifts, Railroad Equipment, Motor Grader, Snow Equipment Tractors, Crushers, Light Towers, Pipe Layers, Drilling Rigs, Earth Movers, Haulers, Step Decks, Bucket Trucks and Tractors. Flatbed Trailers, Removable Gooseneck Trailers, Lowboy Trailers, Step Deck Trailers, Double Drop Trailers, Hot Shot Trailers, Specialized Trailers and Extendable Trailers built to handle any and all over-sized vehicle. Heavy Equipment Transport Services. Once your oversized equipment has been picked up by one of our fully licensed, insured and bonded carriers, our dispatch department will be in constant communication with you until the vehicles have been delivered. Our driver will contact you within 24 hours to schedule the time for the pickup and 24 hours before the date of delivery. When you need Oversized Equipment Transportation-Heavy Equipment Transport, whether you need an expert for hauling trailers, forklifts or dump trucks, we can handle it. If you are a specialty dealer, construction company, police department or military personnel, we will set up a repeat customer id account and offer discounts for multiple specialty vehicle transportation shipments. Also, be sure to ask us about our car transport services. Shipping your oversized loads and overweight freight, Heavy Equipment Transport is a mighty challenge, notwithstanding for those with broad involvement with particular transportation. Regardless of which Heavy Equipment Transport Industry, when you require focused transportation experts for your larger than average shipments you can rely on International Logistics Express, Inc’s group ability to send your curiously large loads securely and effectively. Heavy Equipment Transport Services for all your needs! Heavy Equipment Transport. Transportation larger than average freight is a test we have confronted effectively for a long time. Every single curiously large shipment is special and requires learned and proficient consideration to guarantee the wellbeing, appropriate taking care of and consistency with a wide range of directions. At International Logistics Express, Inc., our experts go the additional progression for the delivery of your curiously large freight anyplace on the planet and adopt a hands-on strategy at the arranging and execution of your over-dimensional venture. Our Heavy Equipment Transport service include to pack your cargo appropriately, pick the best possible transporter, acquire protection and timetable a helpful conveyance date.e.